Author(s): Farid Abrigach, Btissam Bouchal, Olivier Riant, Yohan Mace, Abdelilah Takfaoui, Smaail Radi, Abdelouahad Oussaid, Mohammed Bellaoui, Medical Biology Unit, Faculty of Medicine and Pharmacy of Oujda, University Mohammed the First, Oujda, Morocco. Rachid Touzani. A new library of N,N,N’,N’ -tetradentate pyrazoly compounds containing a pyrazole moiety was synthesized by the condensation of (3,5-dimethyl-1H-pyrazol-1-yl)methanol 2a or (1H-pyrazol-1-yl)methanol 2b with a series of primary diamines in refluxed acetonitrile for 6h. 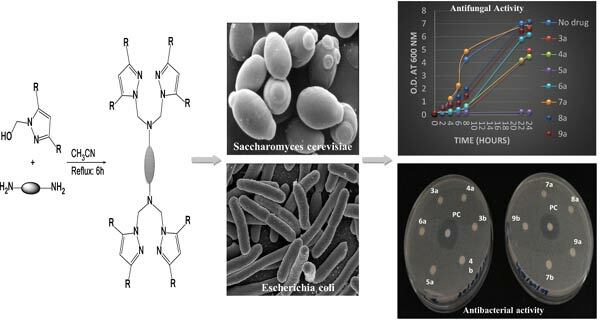 The antifungal activity against the budding yeast Saccharomyces cerevisiae, as well as the antibacterial activity against Escherichia coli of these new tetradentate ligands were studied. We found that these tetradentate ligands act specifically as antifungal agents and lack antibacterial activity. Their biological activities depend on the nature of the structure of the compounds. Keywords: Tetradentate pyrazole, synthesis, donor-groups, antibacterial, antifungal. Affiliation:Medical Biology Unit, Faculty of Medicine and Pharmacy of Oujda, University Mohammed the First, Oujda, Morocco. Keywords:Tetradentate pyrazole, synthesis, donor-groups, antibacterial, antifungal. Abstract:A new library of N,N,N’,N’ -tetradentate pyrazoly compounds containing a pyrazole moiety was synthesized by the condensation of (3,5-dimethyl-1H-pyrazol-1-yl)methanol 2a or (1H-pyrazol-1-yl)methanol 2b with a series of primary diamines in refluxed acetonitrile for 6h. The antifungal activity against the budding yeast Saccharomyces cerevisiae, as well as the antibacterial activity against Escherichia coli of these new tetradentate ligands were studied. We found that these tetradentate ligands act specifically as antifungal agents and lack antibacterial activity. Their biological activities depend on the nature of the structure of the compounds.